The 'heart' of any custom rifle is the action. A good action is essential for competitive accuracy, and no component is more important in terms of rifle longevity and shooter safety. Custom actions start at around $750 and can cost three times that amount for the jumbo 50 BMG actions. Why is a custom action worth the extra cost? First, the action will be stiffer, straighter, and (usually) stronger. An action such as a Panda or Viper offers reduced weight plus enhanced bedding surface. $1000.00 invested in a Barnard 'P' buys a super-strong action AND a match-grade trigger. And, whether you spend $750 or double that sum, a quality custom action, when combined with a good barrel and stock, can deliver winning results at the range. The better custom actions also retain their value very well--something that can't be said for most factory actions. Long-popular with Palma and full-bore shooters, the Barnard Precision's 'P' and 'PL' (long) actions are strong, all-steel units that come complete with an excellent trigger system for under $1000.00. Barnard actions are competition-ready out of the box, no "blue-printing" required. 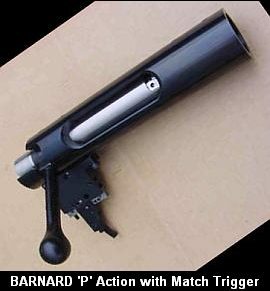 All Barnard 'P' and 'PL' actions feature triple locking lugs, high-strength Sako-style extractors, and 1/16" diameter firing pins as standard. 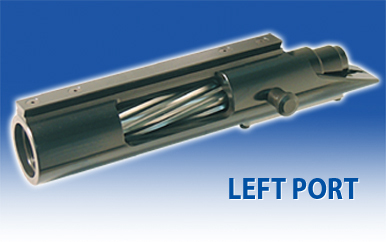 The 'PL' action is extended and "beefed up" to fit cartridges up to a .338 Lapua Magnum. The action body is longer, with a bigger port, and the bolt body is 24mm in diameter, compared to 22mm for the 'P' action. With a long bolt handle providing good leverage, the tri-lug bolt opens easily, and it closes VERY smoothly with lock-up as solid as a bank vault. The excellent three-lever trigger fitted with 'P' and 'PL' actions adjusts from 8 ounces to 4 pounds and can be set as a single-stage or double stage. For Palma and F-Class applications, this is all the trigger you'll ever need, making the Barnard a good value. Most other custom actions do not include a match trigger. 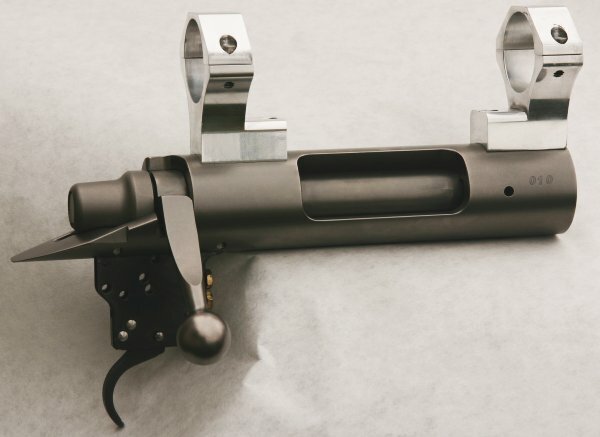 Get a stock with a V-block installed and you have a bolt-in solution requiring no gunsmithing other than barrel-fitting. 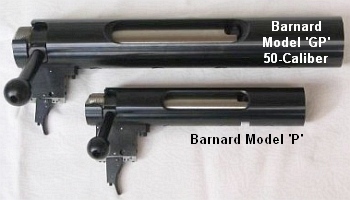 Barnard also makes a smaller 'S' action with a Remington 700 footprint, that uses Rem-compatible triggers such as Jewell, Kelbly, and Timney. It is available both as a single-shot and as a repeater action (shown above). New for 2007 is a massive, enormously strong Barnard 50-cal 'GP' action. Measuring 12.4" in length, and weighing 8.14 lbs. (3.7 kg), the new Model 'GP' action features a triple-lug 34mm-diameter bolt, Sako-type extractor, 1.670" long x 1.50" diameter x 12 tpi barrel shank thread, four 8mm action screws, and six 5mm scope base screw holes. MTGuns and Robertson Composites are, respectively, the American and Canadian importers for the New Zealand-crafted Barnard actions. You can also reach Barnard directly in New Zealand at 011 +64 (0)9 828 4819 (telephone and fax)or e-mail address bmbarn[at]ihug.co.nz. Vee-Blocks and a bolt-face insert that allows you adapt magnum 'PL' actions to shoot .308-rimmed cases are available from True-Flite Ltd. in New Zealand. BAT Machine actions are milled from solid billet. The machining is the best in the industry. Actions come in a variety of sizes and profiles--round, multi-flat, or octagonal, with various diameters and port configurations. The shorter BAT actions use a 1.062" tenon and 18 tpi thread pitch, while the longer actions use a 1.125" tenon with 16 tpi pitch. Actions start at about $1,050, but price depends considerably depending on size and features. 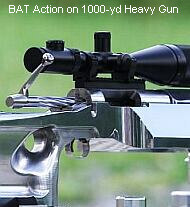 For 1000-yard guns where weight is not a big issue, we like the BAT MB action. This is a medium action with an extended body forward of the port, and three action screws. This provides more bedding surface and better support for long heavy barrels. Our latest AccurateShooter.com project gun is a 6-6.5x47 + 6.5x47 switch-barrel using a multi-flat BAT MB action. With BAT actions being so popular, the wait for a new action built to spec can be many months. If you need a BAT in a hurry, check with Bruno Shooters Supply. Bruno's maintains a standing order for BAT actions, all sizes, and Bruno's usually has a dozen or more in inventory (both two-lug and three-lug). RB, LP round SV benchrest actions are most common on Bruno's shelves, and but Lester Bruno also tries to keep the bigger BAT actions in stock. Three-lug BAT Machine actions are the hot ticket right now in short-range benchrest. BAT makes the tri-lug in both stainless and chrome-moly. Many top shooters feel that the tri-lug, with its shorter bolt throw, and roller-fitted cam mechanism (like a Barnard), can be worked faster than a dual-lug design, allowing shooters to get more rounds downrange in a hurry. However you can expect to wait up to 6 months (or more) if you custom order one. 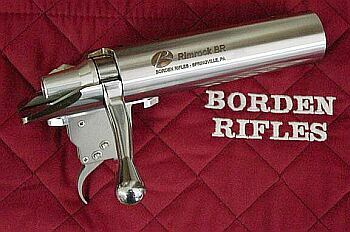 To get your hands on a BAT Tri-lug right away, call Lester Bruno at Bruno Shooters Supply. Lester probably can get you a three-lug as quickly as any vendor. He had 30+ BAT actions in stock in the summer of 2007. Lester notes: "Both stainless and chrome-moly work equally well." Brunos gets new BAT actions weekly, in all three bolt configurations: PPC, .308 and Magnum. Prices start at $965 for a two-lug SV action, and $1180 for a three-lug. Call Brunos for availability, (623) 587-7641. Jim Borden is one of the top benchrest gunsmiths in the country, so he knows how a custom action has to perform. He has invented many of the features you see on today's top custom actions, such as "Borden bumps". Though in the past Jim had an association with Nesika Bay, Jim's company now produces their own actions. Here shown are the Borden BR-2 action (right) and the Borden Repeater (below). 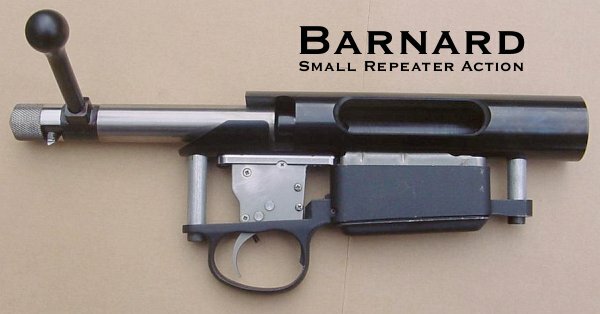 The Repeater is ideal for a precision hunting rifle or for use in the Hunter Benchrest Class. Borden BR actions start at about $1100. Borden Rifles has a new series of more-affordable actions designed for the hunter, varminter, and tactical shooter. 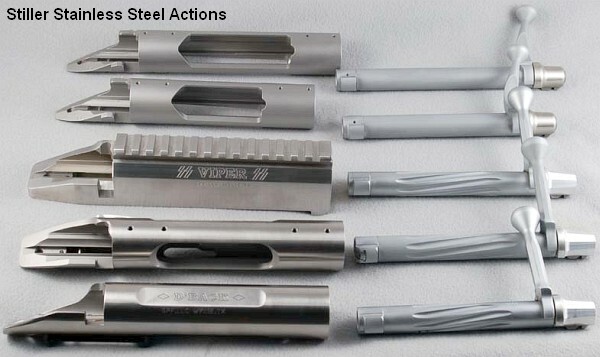 These $925.00 Alpine and Timberline stainless steel actions feature a 1.350" outer diameter so they are a drop-in replacement for Rem 700 actions. 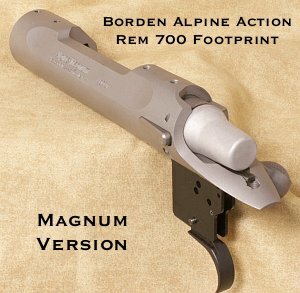 The Alpine (Rem 700 short footprint) and Timberline (Rem 700 long footprint) actions are available in regular and magnum versions, both as single-shots and repeaters. A fluted bolt is standard and a Remington bolt handle is brazed to the fluted bolt body. On the Alpine and Timberline actions, all finish work on bodies and bolts is done in the hardened state. Bolt bodies are cylindrically ground. Scope base mounting holes are milled and thread milled to 8x40 threads and are all blind holes threaded to the bottom. Barrel tenon threads are 1 1/16 x 18 TPI. 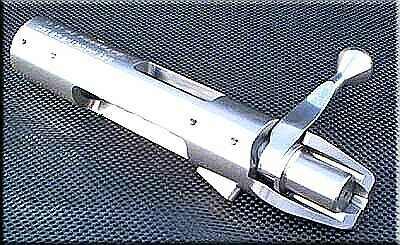 The bolts have Remington style nose and utilize the Sako style extractor with the ejector plunger positioned in the boltface to provide for a low ejection angle. The Timberline and Alpine Actions utilize the proprietary feed rails that Gary Amatrudo and Jim Borden designed for the Rimrock repeater to enable smooth feeding of large diameter, non belted magnum cases such as the WSM, SAUM and Ultra Mag cases. Jim Borden notes: "The original intent of these actions was to provide a less expensive action than the Rimrock action for those building 'economy' hunting rifles. These actions are a good value for building hunting rifles versus the use of a "trued" factory action. During the machining of these actions it became apparent that two versions of the Alpine and Timberline actions were needed. We have a Standard version that has the same magazine wells and loading ports as Remington 700 Actions. 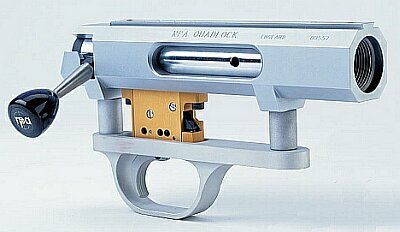 A magnum version of this action has a longer loading port and a magazine well to use the Wyatt Length Magazine boxes. All of the Right hand and left hand versions of the Alpine and Timberline actions are available. Delivery time is currently 20 to 26 weeks. We added two more CNC machines to our shop in March 2007 to accelerate deliveries." With a reputation of being very smooth and fast to operate, the Farley action quickly became popular with short-range benchrest shooters. 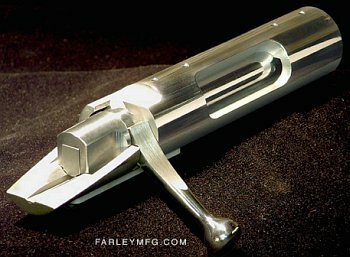 The original Farley action was made from cast stainless and had many unique features, such as an ejector that could be switched on and off. It was a beefy 8" action, weighing 33 ounces, with a 1.062" Tenon and 16 tpi thread. Click for Farley Mfg. Website. The new Black Widow action (shown right and below) is a departure for Farley. Previously, Farley actions started with castings. The new Black Widow is machined from heat-treated Rockwell 50 stainless billet and features EDM-cut raceways for ultra-precise fit and function. It is offered as a Left Port, Right Port, or Dual Port. The price, with either 6PPC or .308 bolt-face, is $1100 for a single port and $1500 for a dual port. 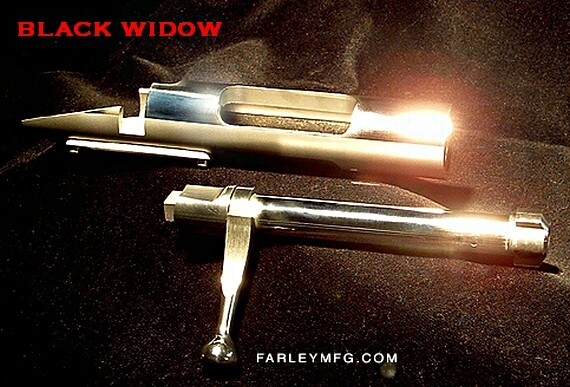 Noted gunsmith and BR shooter Mike Bryant says Farley's new Black Widow is one of the fastest actions available, a good choice for "runners" who send all their rounds downrange as rapidly as possible. Haverkamp Precision is a relatively new entrant into the custom action field, but Tom Haverkamp produces a very high-quality product. The LV40 action, $885.00 before options, is similar to the Remington short style, except it is .200" longer and .060" larger in diameter. The extra length allows a longer barrel tenon, which increases barrel support and rigidity. The Haverkamp Precision action does not use the detachable recoil lug sandwiched between the action and barrel. The tenon thread is 1 1/16” – 18 TPI. The port opening is 2.400" long. Weight of the action with trigger hanger is 34 ounces. The receiver bottom is solid (no magazine cutout) and has a flat, milled section for added bedding support. A detachable aluminum trigger hanger allows for rapid removal of the trigger for adjusting without removing the barreled action from the stock. (Drop out trigger) uses any Remington style trigger: Jewell, Timney, Basics, etc. Standard price includes deep machined helical fluting of the bolt. Stocks inletted for Remington short actions will work with a Haverkamp Precision action with some modification. The actions can be glued in or pillar bedded. Pillar bedding kits with aluminum trigger guard will be available in the near future. The bolt release is either of two types: A: Standard Pull pin style made from 4340 alloy steel; optional Push style, stylish (additional cost). John Pierce has recently introduced a new custom action that duplicates the size and footprint of the Remington 700, but with more precise tolerances. It was favorably reviewed in the April '07 edition of Precision Shooting. Designed for the hunting, tactical, and varmint markets, the Pierce Engineering action carries an introductory price of $885.00 for .223, PPC, .308, or Magnum bolt faces. The new action, is available in short, long (8.7"), and ultra-long (9") versions. (Priced at $1000, the 9" versions are special order and can be fitted with a longer 1" tenon to support long, heavy barrels.) All Pierce action are made from 4140 chrome-moly steel and come standard with a rugged CeraKote finish. Bluing and NP-3 coatings are also available (call for quote). The bolt is a precision-machined Pacific Tool unit, spiral-fluted, and customized with Pierce handle and side-mount bolt release. John Pierce, a highly-regarded gunsmith and machinist, created his new action in response to numerous customer requests to accurize mass-produced actions. Accurizing involved many operations: recutting threads, machining bolt faces, sleeving bolts, reaming action bodies, and moving handles. John concluded it made more sense to start with a custom action made correctly from the get-go. Designed to provide benchrest accuracy for the sporting rifle, the 1.350"-diameter Pierce Action offers full drop-in compatibility with stocks inletted for the Rem 700. Quadlock: A very rigid, high quality action with ultra-short lock-time, the RPA Quadlock ($1598 with trigger and trigger guard) is a favorite of Palma shooters worldwide. It features a short-throw 4-lug bolt, integrated sight rail, and a very slick RPA-made trigger unit. Quadlocks appear to be stainless but they are actually very hard chrome-moly with either a chrome powder coat (silver) or black oxide coating. The Quadlock is ideal for Cross-the-course and position shooting with .308-size cartridges. It features a short-throw 4-lug bolt, integrated sight rail, and a very slick RPA-made trigger unit. The Quadlock uses a distinctive Bellville washer stack in its fire control system rather than a conventional spring. This provides a very speedy lock time--a very important feature for prone and position shooters who don't have the advantage of mechanical rests to steady their rifles. Given the current exchange rate, the Quadlock is a pricey alternative for North Americans, but it enjoys many distinctive features including ultra-short lock time, integrated recoil lug, factory v-block availability, and excellent strength and rigidity. Because of the relatively high effort required by the 4-lug design combined with the Belleville washer stack, you wouldn't want a Quadlock for a short-range benchrest gun. 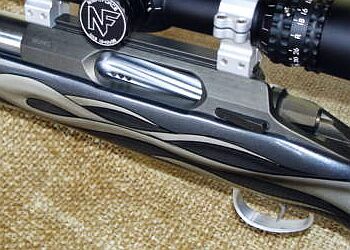 The extra muscle required to open the bolt could upset the gun on the bags. But for a Palma or Highpower shooter, this is not an issue. 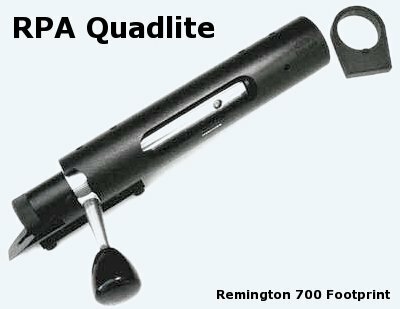 Quadlite: For the smaller-sized 6BR and 6XC cartridges, the smaller RPA Quadlite action is probably a better choice, as it feeds the fat-cased, long-nosed rounds better. The $1398 Quadlite ships without trigger or bottom metal. You can also use any Remington-compliant trigger group. 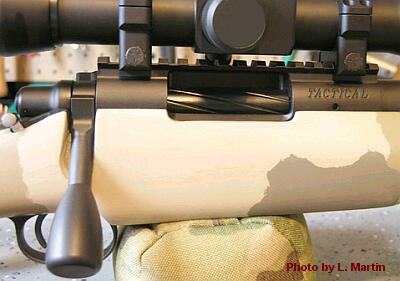 RPA Quadlock and Quadlite actions are sold in the USA by Creedmoor Sports. On the website of Triple J Imports, an Australian competition shooting supplies vendor, you'll find much more information on the Quadlock and Quadlite actions, along with many photos. Stiller Precision built its reputation with the Viper, a Panda-style flat-bottomed aluminum action with steel bolt and steel insert for the barrel. Today Stiller Precision offers a full line-up of stainless steel actions--even a stainless Viper. Stiller's less-expensive line of Predator and Tac actions have proven exceptionally popular, and they offer great value for the money. The affordable $750.00 stainless Predator action is a drop-in replacement for the Remington 700. It is either single-shot or magazine fed. Long and short actions are available with .223, .308 or Magnum boltfaces. The top is full round and uses two front bases rather then the stepped down one on the rear of a Remington. This allows for better scope alignment. The magazine-fed actions use a 0.150" extended cutout to allow for longer cartridges and H-S Precision or Wyatt boxes. The port has been opened a little for the same reasons. The bolt is a little looser than benchrest actions to avoid problems with grit and particles. It has 0.004" clearance, much less than a Remington, but a little more than with BR actions. Jerry Stiller says: "If you are going out to buy a Remington donor rifle, STOP, give us a call. The Predator may cost less by the time that Rem action is trued and blue-printed." The success of Stiller's stainless actions does not diminish the respect we hold for the Stiller's aluminum actions: Cobra (small), Viper (Medium), and Python (large). Many top shooters who have used the Viper, including our own Jason Baney, will tell you the Viper is one of the smoothest actions available today. It comes hard anodized for durability, and it is available with Stiller's unique Drop Port--a great idea that really works. The Viper represents one of the best values among custom actions. A Viper action costs $950 complete with trigger guard and precision scope rings. (And if you ask Jerry for his "gunsmith price" he might knock a few dollars off that number.) The Viper is now also available in a stainless version with a +20 MOA picatinny rail on top for $1300. A less expensive all-stainless option is the popular Diamondback, which is similar to a Nesika, and suitable for everything from short-range benchrest to 1000-yard heavy guns. Like the aluminum Viper, the Diamondback can be ordered with a drop port for PPC, BR, or BR Improved (BRX, Dasher) cases. We love the drop port system. It works great in practice. Keep in mind, however, that ordering a Stiller action with a drop-port locks you in to the PPC/BR size of case. You won't be able to use the drop-port feature if you decide later to move up in cartridge size. To see Stiller's full line-up of actions, visit ViperActions.com. Panda (top left), Grizzly II (lower), Stolle Swindlehurst 22LR (right). The Stolle Panda has won more Benchrest matches than any other action. It is aluminum with a steel 1.062" tenon, 18 tpi twist. The flat bottom provides a large, secure bedding surface. The integral rail on top adds stiffness, and provides a built-in high precision mount for scope rings. A larger "Big-Bore Panda" is available with an integrated recoil lug in the front. Panda actions start at $1050 including trigger guard and fluted bolt. Kodiak (Hunter Class) models start at $1100, while the single-shot Grizzly II costs $1200. Microport ejection is available on most models for another $125. Kelbly actions. The Surgeon action is a relatively new product optimized for field and Tactical use. When you consider all the upgrades--integral recoil lug, built-in +20 MOA scope rail, solid, oversize bolt handle, it represents very good value compared to a blue-printed Rem 700 Action. Terry Cross has used his Surgeon-actioned 260 AI to win many major tactical matches. Terry reports: "Final dimensions are machined after heat-treating to insure perfect squareness and alignment. This action also boasts more thread length for the barrel shank. Typical barrel shanks for the Surgeon have a thread length of 0.950" versus the 0.700" thread length in Remington Model 700 style actions. This provides a 37% increase in barrel engagement. This action is built to perform and survive in the grueling environment of tactical-type field shooting as well as Law Enforcement and military sniper applications. It is built to the same precision and squareness as the best benchrest action but has fit tolerances that allow it to function under harsh conditions, and where dirt or debris might stop a benchrest action in its tracks. Checking the receiver and boltin fixtures confirmed that it is turn-key with no other work needed except the metal finish of your choice. The Surgeon action is also offered in a tighter-fitting, single-shot version for the F-Class and varmint hunting crowd.
? Copyright 2007 AccurateShooter.com, All Rights Reserved. No reproduction without advance permission in writing.